We are experiencing some pleasant conditions on our Ft. Lauderdale fishing charters. A bit of wet weather down below us but up here the rain storms have backed off the last few days. Typical summer heat and less wind which makes it feel a little warmer but makes for nice fishing with a minimal seas. 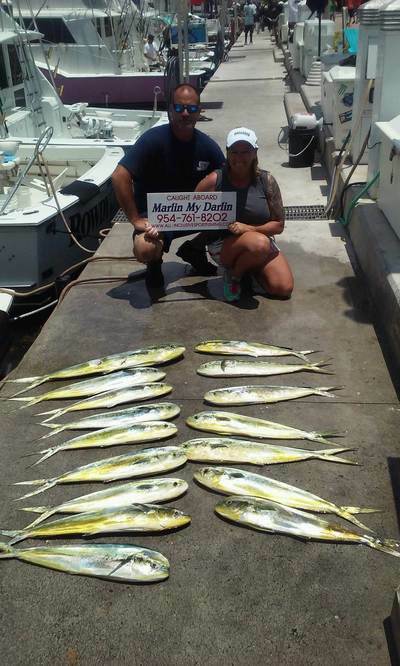 Good news in that the Mahi-Mahi have shown up offshore. Good numbers of keeper sized fish as well. While we had some reasonable catches of them prior to a lull last week those fish were close to shore. There are Mahi out there again but this time they are out in the deep and few to be found inside 10 miles, mostly further. This time of year the fish are more likely to stay around the boat once located and that is a plus. As usual find something floating or an edge. The open water fish encountered will be moving but at a slower rate of travel than earlier in the summer. When these fish show at over 10 miles like this a full day charter is best as fishing will involve an open water hunt and find and as we said roughly 10 miles is the minimum. Here’s hoping they show a bit closer to shore but if they do it probably won’t be much closer. Inshore on the reefs Kings and Bonito are providing decent action for those anglers wishing only a half day trip. We continue to catch Wahoo regularly along the reef line as well. Occasional Blackfin Tuna or a Sailfish there too.